Hyvinkään Ilmailukerho (est. 1948) is an active flying club operating at Hyvinkää Airfield (EFHV), less than an hour’s drive north of Helsinki. Our main activity is gliding (soaring). Our fleet consists of 2 two-seaters and 6 single-seaters; we also own two motor gliders and an aerotow aircraft. We are one of the few gliding clubs in Finland using winch-launching, and have acquired a brand-new winch (V-2008, Skylaunch-based). A number of private owners also operate from the site. 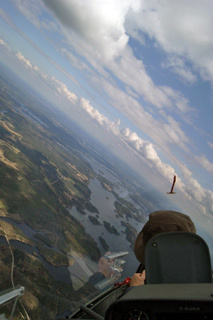 If you want to join the club or are just interested in having a glider flight during your stay in Finland, please do not hesitate to contact us. Give us a call, send an email or just drop in to see us at Lentokentäntie, Hyvinkää (about 4 km NE of the town centre). You can get there by taking a train to Hyvinkää (H- or R-train from Helsinki) and then walk/taxi, or call for someone to come and pick you up. See you there! !